Tung oil is produced from the seeds of the tung oil tree (Aleurites fordii). This penetrating oil has been used in China for finishing fine furniture since 500 B.C. Teak oil is simply refined tung or linseed oil that may also incorporate polymers to provide a faster drying hard finish. Tung oil, also known as Chinese wood oil, is a 100 percent natural product that is pressed from the oil-rich seeds. It is applied over bare wood, after the wood has been sanded and wiped clean. It is a time-consuming process that produces a fine finish with a light sheen on wood furniture. The variety carried in most stores is Watco Tung Oil. First, thin the tung oil using 1 part oil to 3 parts mineral spirits or turpentine. Wipe the tung oil mixture over a smoothly sanded, bare wood such as teak, mahogany or other fine-grained hardwood. Wipe the excess oil off the wood, wait 20 minutes and wipe off any oil drops that may appear. Allow the finish to dry for two to three days. Lightly sand the wood with 320 fine-grit sandpaper. 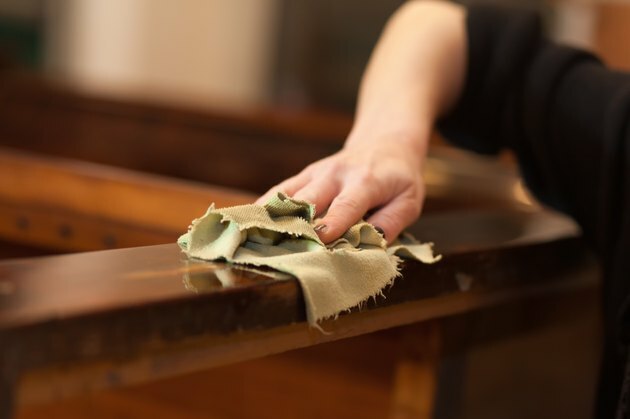 Wipe it completely clean of dust with a tack cloth, and then wipe on a coat of tung oil mixed in equal parts with mineral spirits or turpentine. Rub off the excess oil and allow it to dry for another two or three days. Continue sanding and wiping the piece with a tung oil and thinner mixture, increasing the tung oil with each layer, until you have five to seven coats covering the wood. Tung oil does not evaporate or dry on the surface of the wood. Instead, the components in the oil combine with oxygen and cure to form a hard, water-resistant surface. A thick coat of tung oil will not cure properly, instead forming a thick, wrinkled, soft surface that may never completely cure. Always apply tung oil in thin coats and allow each coat to cure before adding the next. Tung oil is usually used on fine-grained hardwoods, as it does not fill in the wide pores of oak. If you like the natural texture of oak furniture, use tung oil as a finish. Teak oil, similar to Danish oil, is a name, not a particular formulation. One big difference between tung oil and Danish oil and teak oil is the price. Despite being made up of various oils and additives, both Danish oil and teak oil are often significantly more expensive than 100 percent tung oil. In general, teak oil is refined tung or linseed oil mixed with polymers and other additives to help it wipe on easily and cure faster. Like tung oil, teak oil is applied in thin layers; allow it to cure for 24 hours or according to the manufacturer's directions before applying the next coat. Users may use only two to four coats of teak oil to produce a smooth finish. Teak oil finishes are usually promoted for use on teak furniture. Lightly sand between each coat of teak oil to produce a smooth, light sheen or satin finish.